This was our third visit to Maui (Kihei area) but our first stay at Kamaole Sands. The unit was great. Convenient location to onsite amenities and one of the closest buildings to the beach. A lovely view to enjoy a drink or two on the lanai. Kamaole III right across the street. The condo itself was very well equipped — from a well stocked kitchen (lots of spices and necessary supplies available) to the closet on the lanai full of everything you could possibly need for the beach (provided you wanted to lug it with you – we couldn’t be bothered with taking the chairs/mats with us. We only used the coolers and boogie board). The pool area was great. Can’t comment on the Mai Tai Wednesday party as it was cancelled due to Hurricane Lane attempting to make an impact during our stay (which thankfully it did not). Earl was very friendly and helpful to deal with. He even called during our stay (due to Hurricane forecast) to make sure everything was secure and that we we staying safe. Overall a rather totally enjoyable stay. We had a fantastic time in this condo. It has everything that is necessary and more! The location is perfect, love it being a 1 minute walk to the beach. Plus all the amenities are within walking distance too. The complex and grounds are very well cared for as well which makes for sitting on the lanai truly beautiful. We were very pleased with our stay on Maui. Very nice condo on beautiful grounds! The building that this condo is in is the closest to beautiful Kamaole Beach 3, right across the street! The condo was clean, comfortable, and very nicely decorated. It was clear that the owners put a lot of thought into making sure that there was everything a person could want in this condo! Everything was so well organized in the cabinets and we appreciated that there was spices,starter laundry soap, tin foil etc. The grounds are beautiful and well maintained. We loved the pool and enjoyed Mai Tai Wednesday’s, when they have complimentary Mai Tai’s and entertainment. You will not regret renting this condo! We’ve grown very fond of this place, its been just a little slice of heaven, look forward to returning. If it is available book it! The owners are great and make sure you have everything you need before arrival. The location is perfect, great beaches, food and fun all within a 5-10 minute drive. Enjoy your stay!! And an email received from this: Our stay was great and your condo was perfect!! We have already begun planning our next visit, so hopefully your condo will be available when we return! Thanks for everything and I hope all is well!! Wow! Everything about this condo is perfect! Location, facilities, amenities, – we couldn’t be happier! 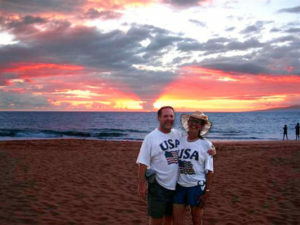 We explored many different areas on Maui and both agreed we had lucked out by staying here in Kihei. We will definitely recommend to others and hope to be back ourselves! Kamaole Sands is a beautiful condo complex, and this condo in particular is one of the best. It has a fully stocked kitchen with everything you need to cook any kind of meal, and it has a closet on the lanai full of beach gear. The lanai has a great view of the main court yard and the gardens. It’s conveniently located near the main entrance, the office and the tennis courts, and is in a very quiet location. The beach is a short stroll across the street and has fantastic snorkelling with coral reefs and lots of colourful fish, and great waves for boogie boarding. Within an easy walk are recommended places for food/drink, Fred’s Mexican, Moose Mcgillicuddy’s, and 808 Bistro. This trip to Maui was like an escape to paradise and we can’t wait to come back again. Road 2 Hana, Snorkeling – the distance 2 the ocean, everything, pretty, pretty, good. It’s a pity that the distance is so long to Germany. I just wanted to drop you a note to say that we are having a wonderful time and are very much enjoying your lovely suite. Great location if you like scuba diving/snorkling. Good beaches for families and sun worshippers just across the street. The condo had everything, it was very well stocked with everything you need. I like to cook so the amenities in the kitchen were a plus. Unit was clean and well taken care of. This is a one bedroom unit but there is a pull out sofa bed and 2 full baths. Suitable for a family with small children, couples. The condo overlooks the grounds which are well maintained. It is also close to the pool, should you tire of the beach. Close to shopping, restaurants, in short everything you need is close by. It’s close to the main roads so quick trip to the north shore and all other places you will want to see in Maui. Couldn’t believe everything that there was in the condo. As a frequent visitor to Maui I was very impressed. Earl & Mary – I will definitely be using your condo again! My wife and I had a fabulous time in Maui and at your condo. Thanks for the great stay and we will keep your place in mind if we ever return to Maui and will recommend it to our friends and family. Hope everyone who stays here has as lovely a time as we have. This is a special place on this lovely island. We feel it as our home away from home! Once again we have enjoyed our stay at your lovely location with so many “feel right at home” amenities. As usual, Maui is an awesome location for visitors and we always enjoy ourselves. We know you and family must feel very fortunate. From the time we arrived until we left, we felt very at home in your wonderful condo. This was our first visit to Maui ! Thank you for sharing your wonderful condo, It was perfect. We hope to be back next year. Thank you kindly Mary and Earl for providing a wonderful vacation getaway. Maui will continue to call me back and I hope tro be right back here in your cozy home. Many days of relaxation aided by the home away from home feeling I experienced here. Tour of Hana and Scenic tour to Molikini. Once again topped my expectations. I just wanted to say our stay has been fun, relaxing, busy and extremely enjoyable. The kamole sands condos are perfect for us and the accommodations are above expectations. As we are preparing our departure for tomorrow few questions? may we stay until 130 since our flight is 4pm? what is the expectation for the clean up? We had a great time in Maui and your condo was perfect! There isn’t anything I would change about it. It had everything we needed! Thanks again, and we’ll be sure to refer you to our friends. Thoroughly enjoyed your well equipped accommodations. The interior decorating is outstanding!! So appropriate for ocean-side setting. Snorkeled and swam to our hearts content and then relaxed in superb atmosphere! Nice view of the fountains and ponds. Nice linens, good bed, and Bettie Ventura does a nice job for you. Just wanted to thank you for the use of your condo – we had a wonderful time and we were not ready to come home. We are already thinking about our next trip. We enjoyed your condo and all the extra touches you have put into place- it felt like a home away from home. I think my parents may be contacting you about staying at your place in November. Thanks again! Behr’s Condo in Kihei made for a great stay. From the prompt replies to all of our emails and all the information that was provided about the area, we knew we were in good hands. The location within the complex was ideal and everything was in order when we arrived. The condo was equipped with everything we could have needed. It felt very much like home for the week which was great. Not to mention, the weather was amazing the whole time we were there. We want to thank you again for the use of your wonderful condo with all the amenities. Both you and Mary have done a super job in decorating , and making it a perfect place “away from home”. Just a note to say thanks for the Maui housing a few weeks ago. Although I kept getting interrupted on crisis issues with a client for at least three hours all but two days, we still had a great time. Your place is just right for us; the size, location and comforts. We have no idea how to use the multitude of what looks to be an excellent technology entertainment system, so that didn’t depreciate while we were there! Read five books and watched a little tv and of course, ate a good bit of seafood and papaya. Hope we can do this again sometime soon. Your unit is perfect: absolutely spotless, well stocked, friendly management, great setting…..
We LOVE your condo!!!! Is it possible to put our names down for next year? Enjoyed your condo very much. Everything in it was very clean and comfy except the bed. The bed was very clean, just my ortho found the foam a little hard to sleep to sleep on. Thank you so much for making my only stay in Hawaii memorable. Will definitely giving your email to others. Another perfect 21 days in Maui. Once again we enjoyed your condo and its location. We brought the kids this time for the first 10 days for their first trip to Maui. Then sent packing back home to school. A very relaxing quest 2nd half. A delightful holiday in a lovely condo. We found this condo nicely supplied and tastefully decorated. Looking forward to four weeks next year. Michael and I have enjoyed your condo again this year the condo is spacious and Mike loves the new shower. We really appreciate the beach chairs and umbrellas. We really enjoyed your condo. I loved the special touches you added to make it feel like home. We loved Maui & Earl’s condo! Everything is so beautiful. We will see you next year!